September 15, 2017 New York, NY (Chelsea) — Garvey|Simon is pleased to present Alan Bray: Inward Maine, an exhibition featuring the artist’s recent casein landscape paintings. This will be the eighth solo show in New York for the Maine-based artist, and his second solo at Garvey|Simon. The opening reception will take place on October 12, 6-8 pm. The artist will be present. Alan Bray explores the landscape of inland Maine via quiet rambles in the woods, kayak trips down forested streams, and most recently, Google Earth, where he can observe his surroundings from a foreign, aerial view. 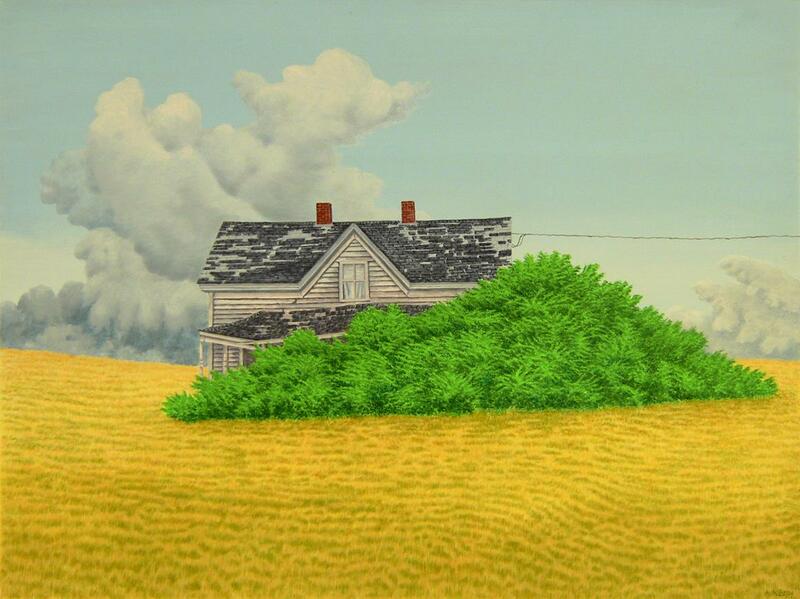 A poetic and visionary painter, his often-peculiar vistas celebrate the phenomena of nature in the ordinary. 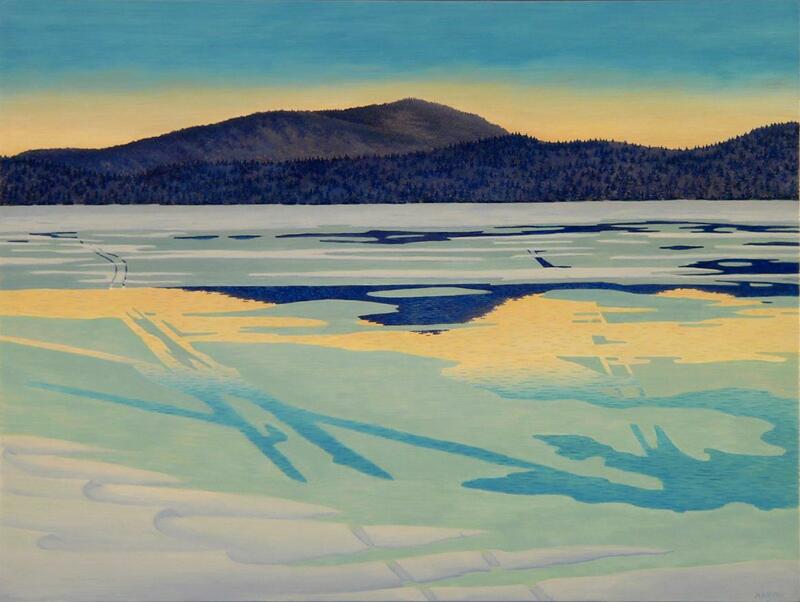 Bray lives and paints in the central Maine Highlands (a less-traveled part of the state), where he was born, raised, and continues to reside. It is the attachment and familiarity with this unique natural environment that provides him with succor. After studying at the Art Institute of Boston and the University of Southern Maine, Bray traveled to Florence in the 1970s to attend Villa Schifanoia Graduate School of Fine Arts. It was in Italy where he discovered his passion for such masters as Fra Angelico and Pietro Lorenzetti. Bray was surprised by the modernity of what he previously knew only from books and considered “funny Christian stuff.” During this seminal time in his life, Bray’s interest in casein painting was kindled. Casein is a milk-based tempera paint with virtually no drying time. Bray’s use of it necessitates thousands of miniscule brushstrokes built up in layers from a mirror-smooth void of white ground. Renaissance painting continues to inform his work as a mature artist, seen through the use of defined edges, bold colors, and the lack of atmospheric or romantic aspects in his paintings. Purity and crispness of line are found throughout Bray’s work. Some critics see characteristics of the surreal in his paintings. Says Bray, “I smile and wince when I hear my work described as surreal, because these paintings are based in actual phenomena,” although he admits that his work often displays jarring juxtapositions. Much of the phenomenological quality in his art comes from terrain vague, a French term that refers to in-between places. For Bray, this space is between the natural and the man-made world. None of his paintings feature people, rather we see the hand of man, often from the area’s forestry industry. “Even good forestry can be ugly,” he notes. His compositions often develop over time as he witnesses nature slowly altering intimately familiar terrain. He captures quiet moments of transformation that would likely be unnoticed by passersby. His newest painting, Swallowed, 2017, (see image above) is inspired by years of watching a dilapidated old house slowly succumb to the elements. Bray found inspiration in the huge, undulating cloud on the horizon echoed by the wavelike clump of Sumac. To Bray’s eye, the movement of grass at that moment seemed oceanic, causing the house to resemble a sinking ship. In January Thaw, 2016, Bray focuses almost entirely on the icy landscape. Golden sunlight moves over mountains and is reflected in the frozen surface of a lake, giving way in spots to deep blue areas of snow melt. Yet in this vista, tracks are seen — perhaps from a cross-country skier, or a snowmobile, but surely manmade. This is the subtly that defines Alan Bray’s paintings. You are receiving this e-mail because you have signed up for the Garvey | Simon Art Access mailing list, or you are acquainted with Liz Garvey.